Saul Bernard Rosenberg, 59, of Lone Pine Road, Adell, Wis., died Sunday, June 28 (1998), in Valley View Medical Center in Plymouth, Wis. He was last employeed as a medical records coder at Froedtert Lutheran Hospital in Milwaukee, Wis., after retiring in 1988 as a senior chief vorpsman in the Navy after 28 years of service. Born May 29, 1939, in Easton, he was a son of the late Isidore and Sophie Edelstein Rosenberg. He was a member of Disabled Veterans in Sheboygan, Wis. He is survived by his wife, the former Cynthia Turck. They were married in November 1996. 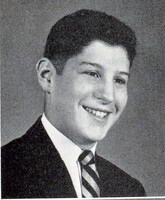 In addition to his wife, he is survived by three sons, Bryan with the Navy in Phallon, Nev., Steven of West Bend, Wis., and Michael in Flordida; three stepsons, Matt Anzia of Adell, Cliff Anzia with the Navy in Norfolk, Va., and Frank Anzia of Cedarburg, Wis.; a brother, Harry of Laguna Niguel, Calif.; and a sister, Pauline Feibush of Westfield, N.J.
Graveside services will be held at 10 a.m. Thursday in B'nai Abraham Cementery in Forks Township. The Ashton Funeral Home, 14th and Northampton streets, Easton, is in charge of arrangements.